The AN/ALQ-144 system is an omni-directional active infrared Countermeasures Set which protects the EH-1H, EH-1X, EH-60A, MH-60K, UH-60A, AH-1F, AH-64A, OV-1D, and RV-1D aircraft from air-to-air and ground-to-air heat seeking (infrared) missiles. The airborne installed system included in this family of equipment are designed to provide jamming of threat IR missile systems. They are active, continuous operating, omni-directional, electrically fuel-fired IR jamming systems designed to confuse or decoy threat IR missile systems. The AN/ALQ-144A (1) and (3) are upgraded versions of the AN/ALQ-144 (V)1 and (V)3 for helicopter applications. The AN/ALQ-147A (V)1 and (V)2 are designed for fixed-wing aircraft. The AN/ALQ-144A(V)1 CMS is the upgrade version of the AN/ALQ-144(V)1. This CMS is an active, continuously operating, omni-directional and electrically fired infrared (IR) jammer designed for use on helicopters to confuse or decoy threat IR missile systems. 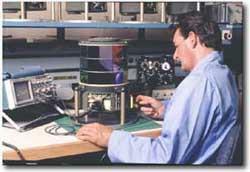 The AN/ALQ-144A(V)1 CMS consists of a transmitter assembly and an operator control unit. The operator control unit has a nine pin connector assembly. The total system weight is 30 pounds. The AN/ALQ-144A(V)1 CMS is designed to provide jamming of all known IR threat missile systems when operated on helicopters equipped with low reflective paint and engine exhaust suppressors. Army helicopters using this system include the OH-58D, EH-60A, UH-60A/L, and MH-60K. The AN/ALQ-144A(V)3 CMS is the upgrade version of the AN/ALQ-144(V)3. It is an active, continuously operating, omni-directional and electrically fired infrared (IR) jammer. This CMS is designed for use on AH-1F and AH-64A/D helicopters to confuse or decoy threat IR missile systems. The AN/ALQ-144A(V)3 CMS is designed to provide jamming of all known IR threat missile systems when operated on helicopters equipped with low reflective paint and engine exhaust suppressors. The AN/ALQ-144A(V)3 CMS consists of a transmitter assembly and an operator control unit (OCU) with dual capabilities. The OCU controls both the AN/ALQ-136(V)1/5 and the AN/ALQ-144(V)3 or AN/ALQ-144A(V)3. The OCU has a 25-pin connector assembly. The total system weight is 30 pounds. The Kiowa Warrior has a unique problem with the ALQ-144 when it is installed on the aircraft. Because of its location on the aircraft it is exposed to engine exhaust. Testing at ATTC, Fort Rucker, demonstrated about 79 hours of flight time before system failure of the ALQ-144. This number of hours dropped after the first internal cleaning was performed. Tests were conducted with the modified low smoke combustion liner installed. Based on ATTC testing the Kiowa Warrior Product Manager�s Office (PMO) recommended external cleaning of the ALQ-144 at the AVUM level every 20 hours/14 day Preventive maintenance Service inspection as the minimum. Internal cleaning of the ALQ-144 was recommended at the AVIM level at each PPM 1 thru 15 done on the aircraft; this will insure that internal cleaning is accomplished every 40 hours. Old engine liners on the the OH-58D Kiowa Warrior helicopter were generating large quantities of soot which reduced the operational capability of the AN/ALQ-144 Infrared Countermeasure Set. The redesigned Allison Engine Low Smoke Liners has significantly reduced the maintenance requirements of the AN/ALQ-144 and in turn increased operational readiness levels.